You know what's so funny about the way I ended that intro is that the last thing anyone would do when eating a NoCow Cookie is pour out a glass of milk. That would sort of defeat the whole purpose being 'NoCow' right?? I think so too. This whole anti-dairy thing is certainly gaining momentum, that's for certain. And it's very clever by D's Naturals to reposition themselves in this way as the 'NoCow' brand. They're certainly going to gain traction with a very particular crowd of Vegans. That much is for certain. But let's not spend TOO much time rambling on about NoCow. Let's get into the meat of this cookie review, and start talking right away about the flavors of the NoCow cookies. They have four flavors- Peanut Butter, SnickerDoodle, Double Chocolate, and Classic Chocolate Chip. I'm going to describe each of the four flavors in detail, starting with my favorite flavor, which is hands-down the best flavor of NoCow Cookies. Double Chocolate: The double chocolate flavor is, in my opinion, the second best flavor of NoCow cookies. Double Chocolate has that darker cocoa flavor, and a much deeper, more robust chocolate flavor than the regular chocolate chip. It also manages to have more chocolate bits than the regular chocolate chip, which I really enjoy. SnickerDoodle: Ok so you guys know the Lenny's & Larry's SnickerDoodle is one of my favorite flavors, but NoCow didn't QUITE execute their version of SnickerDoodle protein cookies as well. This flavor, I found to be a little bit lacking in the overall flavor department. It has okay texture, just like all of them do frankly, but SnickerDoodle NoCow cookies seem to lack character and dimension of flavor. You do get a tiny bit of that cinnamon sugar taste, but nothing much deeper than that. I think this flavor is edible, and enjoyable enough for a healthy cookie, but not one of my top picks. Classic Chocolate Chip: My least favorite flavor of NoCow cookies is the regular chocolate chip. I found this flavor to really be a letdown, and it was actually the FIRST flavor that I tried. It made me highly pessimistic that I would enjoy any of these NoCow cookies, but of course I did find myself falling for the peanut butter flavor in a big way. But yeah, the regular chocolate chip is super plain and boring. It also seems to allow more of the 'vegan-ey' flavors to come through, than the other three NoCow flavors. Maybe a regular chocolate chip flavor profile just isn't as strong as the others and that is what makes it that way but I really didn't love this flavor of the NoCow cookies. In terms of texture, again, all four flavors are adequate, even enjoyable. I did not love some of the flavors but they are all solid. If I have to compare these NoCow cookies to Lenny's & Larry's from a sheer taste perspective, I'm going to have to give the upper hand to Lenny & Larry's. I will say that Lenny's product has gotten worse since their scandals of the previous few months, but they still do have more experience producing these healthy cookies, and that does become apparent in head-to-head scenarios like we're presenting here. While the texture of NoCow bars are on par with Lenny & Larry, the flavors just aren't quite as bold. 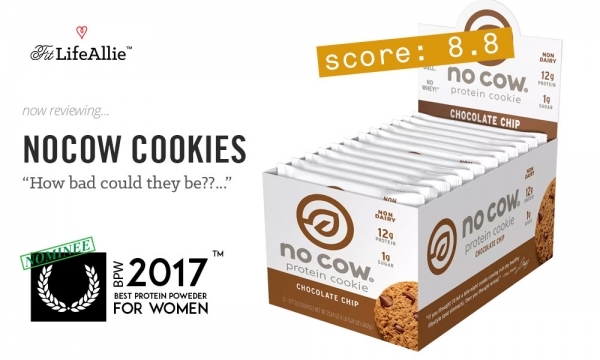 But let's talk about the nutritional profile of the NoCow cookies and see how that changes our perception for the better or worse. What is in NowCow Cookies? From an ingredients perspective, the NoCow cookies are all structured around a core of brown rice and pea proteins. These proteins give the NoCow cookies a total protein content of 13 grams per cookie. These cookies are also much less dense calorically than a Lenny & Larry's cookie, and have a total of 250 calories per 50 gram cookie- about 30% less than a Lenny's, granted however that these NoCow cookies are much smaller in size. The other nutritional ingredients that make up NoCow cookies are either almonds, or peanuts and peanut butter in the Peanut Butter NoCow cookie situation. I honestly think it's because of this that I enjoy the peanut butter flavor more- because the peanuts have better taste, and more familiar texture than the ones made with almond. Texture and softness are provided in these cookies via a combination of palm oil, xanthan gums, and sugar alcohols. Now. This is where I might get some angry folks up in arms with NoCows. Why use so much sugar alcohol?! Why the palm oil?! All these things are probably a nightmare for the good folks at NoCow. But. I get it. You just can't make a cookie without putting at least SOME, well, 'dirty' ingredients in it. And I use dirty very casually there. Only the greenest vegan complains about palm oils and sugar alcohol. So overall I don't mind the composition of these NoCow cookies, and the macros really aren't all that bad. I like that they have a good bit of fiber (9 grams per cookie) and also that they are zero cholesterol, which is because they are not whey/dairy based. The only thing I'm not crazy about is the saturated fat content of these bars, since there are 6 grams of it per NoCow cookie. That might be being too fat-phobic of me, though. Lol. Alright. So. I'll give these an 8/10 overall on nutrition. Let's do a quick packaging review before we wrap up. NoCow Cookies Packaging is Lacking. You guys know by now that I'm literally the stingiest reviewer on the entire internet when it comes to packaging. But I think you will agree that NoCow really does leave some things to be desired aesthetically. The white backdrop leaves me yearning for more COLOR, while the graphics package as a whole is just a little bit, well, BORING to be quite honest with you. The logo, a large leaf icon, is fitting but rather devoid of character or emotion, while the overall layout is similarly bland. NoCow packaging makes good use of it's pictorial elements showing what the actual cookies look like, but then again, nothing on here makes me all that excited to try one of these things out. You know what I mean? Anyways. Packaging isn't everything but I don't think NoCow really 'nailed' their re-brand. Enough on that for now though. Time to summarize this NoCow Vegan Protein cookie review.